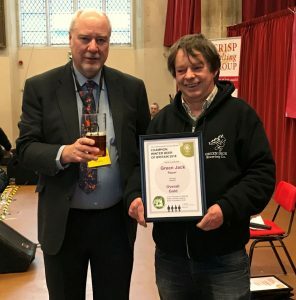 Ripper from Green Jack brewery has won CAMRA’s prestigious Champion Winter Beer of Britain 2018 award on the opening day of the Great British Beer Festival Winter in Norwich. Green Jack Brewery, which is local to the festival and based in Lowestoft, Suffolk, is now one of the largest breweries in East Anglia and winner of multiple real ale awards. It’s Ripper brew is a well-known winter favourite, having taken home the Champion Winter Beer of Britain award in 2007 and securing silver last year. Following over a year of local tasting panels and regional heats leading up to the finals, Ripper was described as a “sweet and warming beer with soft and fruity complex flavours” and “dangerously drinkable” by the judges. The Champion Winter Beer of Britain competition provides an opportunity to showcase the best traditional winter brews in the country, ranging from barley wines, strong old ales, porters and stouts. This year’s Silver went to Broken Dream Breakfast Stout from Siren Craft Brewery, while Cairngorm Brewery took home the Bronze award with Black Gold. All three of the beers will be available to sample at the Great British Beer Festival Winter, along with a huge range of light, ruby and dark ales, as well as a variety of foreign beers, ciders and perries. The Great British Beer Festival Winter runs from 20-24 February at the Halls in Norwich, and is complimented by a number of local events taking place throughout the month as part of the “Fringe”. More than 20 local pubs have planned events including food and drink pairings, tap takeovers, quizzes, and a Treasure Trail, providing the perfect opportunity to explore the city and celebrate Norwich’s beer and pub culture.